I’ve bookmarked Gjelina for over a year now. I’ve walked past it and seen the lines. I’ve wanted to eat here for a very long time. Finally, the last week of 2010, my BFF Sunny and her significant other, Tony, and I made our way to Venice and of course, weren’t surprised to see the line amassed outside. We weren’t detered though. We put our name on the waiting list — were told it would be about 35 minutes — walked over to Abbott Pizza Company, shared a slice just to get us through, walked over to Intelligentsia Coffee, grabbed a drink, browsed in some of the shops, and walked back to Gjelina. Another 15-20 minutes later, we were finally seated on the patio complete with space heaters, at an antique turquoise garden table with chipped off paint. I like it! I like how every table is different. Nothing matches. It added to the charm of this place. The menu is interested and several items caught my eye. But I was here for the pizza and the duck confit. Our server brought us water, gave us a few minutes to go through the menu, and the three of us placed our selections and waited for the food to arrive. Smoked trout salad ($9) sounded much better in print than in reality. Greens are tossed together with avocado, citrus, shaved red onion and lemon but unfortunately, the trout was so minuscule we had to move the greens around a lot to even find it. Think I’ll pass on this next time. Chickpea stew ($12) with greens (collard greens), Israeli couscous, spiced yogurt and harissa was a hunking portion but it tasted absolutely amazing. 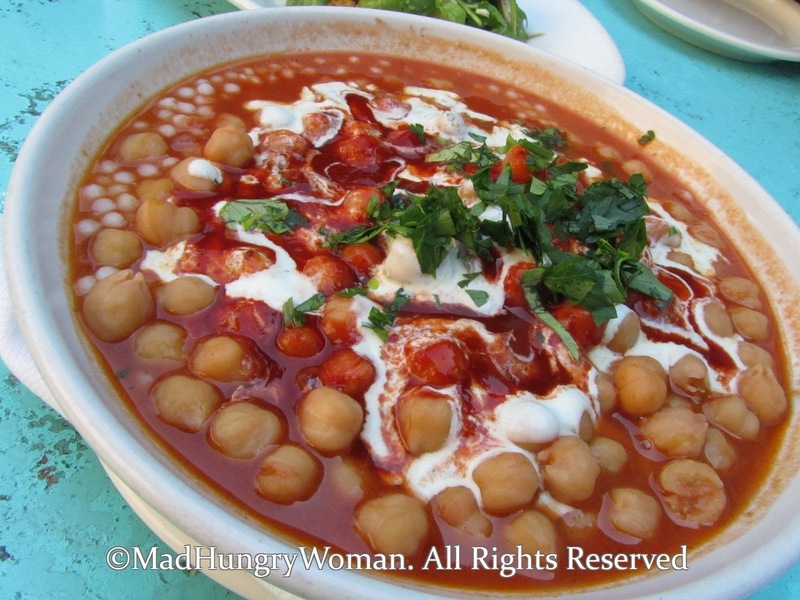 The spiciness of the harissa added a wondrous kick to the dish and honestly, it was too huge a bowl even as an entree so definitely share this item. I love brussels sprouts and these were nicely flavored. Unfortunately, it was so aptly named because charred brussels sprouts ($8) they certainly were! The bacon created the savory aspect while the date and vinegar presented the sweet acidic hints bringing it all together. Taste-wise it was perfect but the burned black brussels sprouts were not visually appealing. 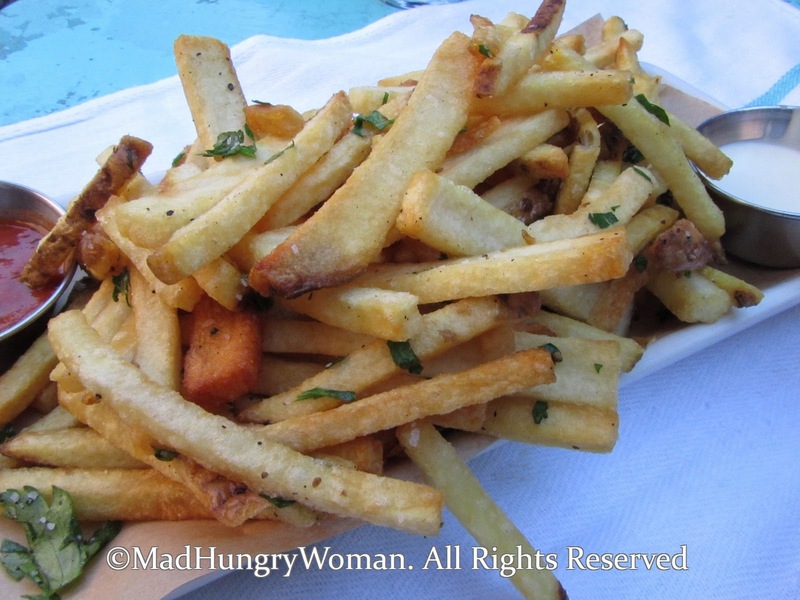 We were in agreement that everyone loves fries so an order of salt and pepper Kennebec frites ($8) were in order. Served with an aioli and romesco, I wasn’t quite sure I liked either sauces immensely. The aioli had the consistency of buttermilk and the flavor very mild. The romesco was also just okay with crushed walnuts and almonds mixed in, but neither really gave oompf to the frites. I’m a big pizza snob and when I heard that the pizzas here were amazing, we had to order at least one. Tony ordered the gruyere, caramelized onions, fromage blanc and arugula ($14) which arrived perfectly blistered. The crust was thin and the arugula added a really fresh finish to the pizza. I’m not sure it needed the caramelized onions because it gave the pizza a sweet flavor, but I did like the contrasting tastes and textures of the gruyere and fromage blanc. We were quite full by now but the piece de resistance had yet to arrive. 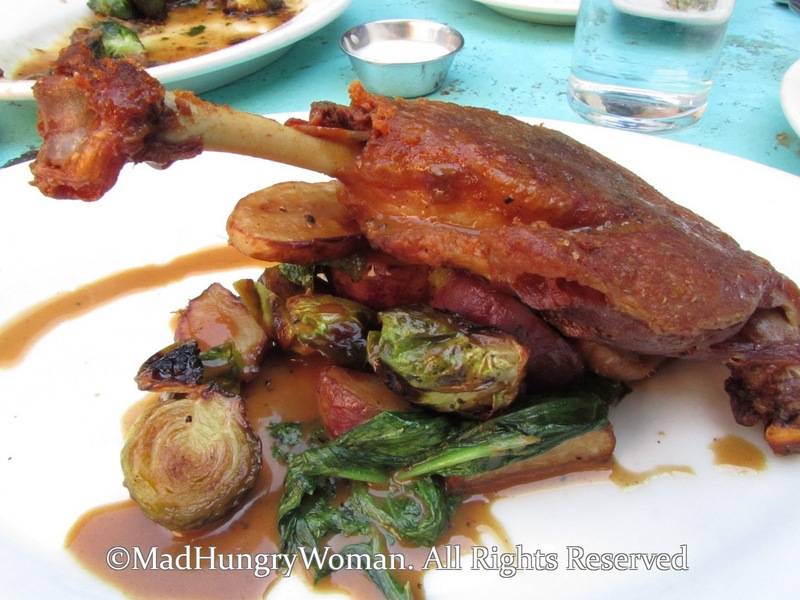 We waited patiently for the crispy duck leg confit ($15), and when it finally did, I attacked it vigorously but it took barely any effort to pull the tender flesh off the bone with my fork. If we had noticed brussels sprouts were one of the acoutrements we probably wouldn’t have ordered it as a side. The turnips were absolutely amazing and I wish there were more of it. Service was good for how busy the place was and everything arrived in a timely fashion. I’m really glad to have experienced Gjelina and would love to return again if I didn’t have to wait an hour for a table. But even so, it was a very good meal!